Theodora Irene Benson (Skrevanos) passed away peacefully on February 14, 2017 at the age of 72. She was born in Moline, Illinois on June 9, 1944 to George and Julie Skrevanos. After graduating from Moline High School in1962, she studied Nursing at Northern Illinois University. While attending NIU, she met the love of her life, Jerry Benson. They were married June 27,1964 in Saint George Greek Orthodox Church, Moline. After several moves in Wisconsin and Illinois as newlyweds, they settled in Champaign, Illinois where they raised their two children. A talented pianist and lifelong music lover, Terry's professional joy and calling was serving as the Executive Director of The Champaign-Urbana Symphony. Later in life, Terry enjoyed traveling to Colorado with her husband, Jerry. She was thrilled to move to Boulder upon retirement and be near the mountains she loved. 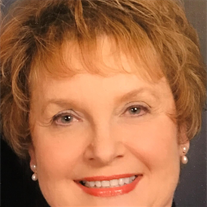 She was an active member of the Saint Luke Christian Orthodox Church in Erie and especially enjoyed being a member of the Myrrhbearers prayer group. Terry was a lover of life who approached life's challenges with a positive attitude and a tenacious spirit. She was a gracious hostess who enjoyed nothing more than bringing joy to others through her warm hospitality and exceptional cooking. She spoiled her two grandchildren immensely and blessed them with countless happy memories of visits with "Yiayia". Her bright personality and generous spirit will be sorely missed. Terry is survived by her husband, Leslie Jerome "Jerry" Benson; her children: Heather Luedtke (Don) and Christopher Benson; her grandchildren: Matthew Luedtke and Erica Luedtke; and her sisters: Victoria Marchi (Steve) and Renee Root (Scott). Visitation will be held Tuesday, February 21, 2017 from 5:00pm-7:00pm at Howe Mortuary, 439 Coffman St, Longmont, CO 80501. Funeral service will be held Wednesday, February 22, 2017, at 10:00am, at Saint Luke Orthodox Christian Church, 722 Austin Ave, Erie, CO followed by a burial in Mount Pleasant Cemetery, 520 Collins Boulevard, Erie, CO. In lieu of flowers, donations may be made to the American Cancer Society for Breast Cancer Research. Terry was a nice person. I remember her as being quiet. Her mom worked at city hall. Terry was my next door neighbor for many years when we went to Logan and Coolidge. I have so many fond memories of playing with her and her two sisters. We had many kool-aid stands together and did tricks on our bikes in the middle of 12th Avenue--before it became a 4 lane major crossroad. They were the first in the neighborhood to have a TV, so every afternoon she would invite me over to watch Howdy Doody and the Mickey Mouse Club. Terry's grandparents lived with the family and her grandmother "Yiayia" was always baking or cooking some wonderful Greek dish or pastry that made the neighborhood smell so wonderful. I had been trying to reconnect with Terry for the last couple of years, but was unable to find her. I had lunch with Karen McCandless (class of '61) last year and she said she could find an address for me. Karen also lived in the same neighborhood when we were growing up. She has an uncanny knack of finding people and found an address for Terry. I wrote to Terry late last year, but was disiappointed that I never heard back from her. Just this past week I received a card from her husband telling me that Terry had received my letter, but was waiting until she felt better to respond to me. But sadly, that didn't happen. Terry's health continued to decline as she dealt with her many health issues and she closed her eyes for the last time on Valentine's Day. I am so grateful to Karen for helping me find Terry and also to Terry's husband for taking time to let me know of Terry's passing. I've watched "Big Fat Greek Wedding" many times and always think of what an adventure it was to grow up next to a Greek family who had so many wonderful family traditions. I will always remember Terry as a dear friend. Terry and I were best friends in Logan School days and I have many memories of sharing those wonderful carefree years with her. We walked home from school together (Imagine that! Walking from school!) and passed notes back and forth hidden between some stones in the ravine across the street. She had a great extended family and they actually spoke Greek in thier home. I was always envious that she got to go to Greek school after regular school and I thought it would be soooo cool to be Greek. So sad, dear girl, that we have lost you without being able to catch up! Rest peacefully. I am sad to hear of the loss of another classmate. I remember Terry as being a very nice and kind girl during our years at Logan, Coolidge and MHS! It sounds like she enjoyed a wonderful life with her husband and family! So sorry to hear about Terry's passing away.I didn't know her til high school. She was always a nice sweet person.Always a kind word for everyone.My sympathy to her family. I didn't know Terry at MHS, but am so grateful for the obituary to see how she had lived out her life that began in Moline in our class. Thanks to all of you who shared a little about Terry so we can remember her. It seems that music and faith played an integral part in her life. Gay, I loved your memories of Terry's Greek heritage and childhood antics. I regret I never got to know her better. Praying for God's comfort to her family in their grief as well as thanking Him for Terry's influence on our class and in the world. Karen McCandless from MHS Class of 1961 is the person that led me to Terry's obituary, Gay. That was very thoughtful of her. I only knew who Terry was in high school. I can't say I really knew her. From reading her obituary I feel as though it is my loss. How many fine, wonderful, talented people have we passed by in our lives without knowing what we have missed? I am sorry to hear of Terry's passing. I have fond memories of her and know that she will be missed greatly by her family and friends. I am sorry to hear of Terry's passing. Praying for her family & friends.